Does anyone know what type of lighting manufactures are using in newer cars to create this wall washing effect? Is it just an LED with a light pipe or something different? I believe this is a newer 5 Series with the light element exposed. These are parts to add the lights to a C class Benz but I'm not sure if it is factory. I'm thinking of adding something to the dash of a Bronco where the soft pad meets the metal dashboard to light up the controls a little but I want it to be a subtle as possible. The only thing I can say having had many cars with adjustable color ambient lighting is that it never looks as good as it does in those photoshopped pics. They always change the exposure to make it seem that it is glowing when in reality you can barely see the light unless it is pitch black out. There is usually too much real ambient light in the city to even see the "ambient lighting" in the car. Strongly disagree. 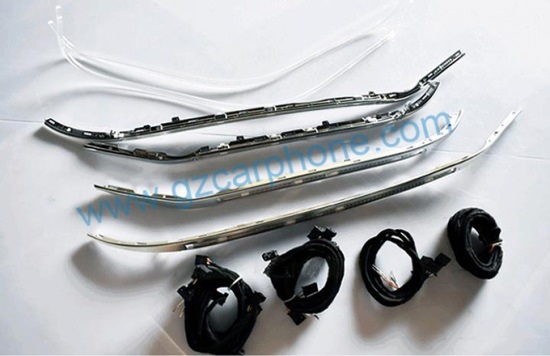 Have you been in any luxury car within the last 2 years with the expansive lighting seen in the OP? If you turn the brightness is up it’s very visible starting at sunset. I have not only been in, but have owned many. And I stand by what I say. I disagree, too. My neighbor's S class is bright as hell inside. And our '14 MINI Cooper had it, set to purple, and it was also bright enough even at dusk. 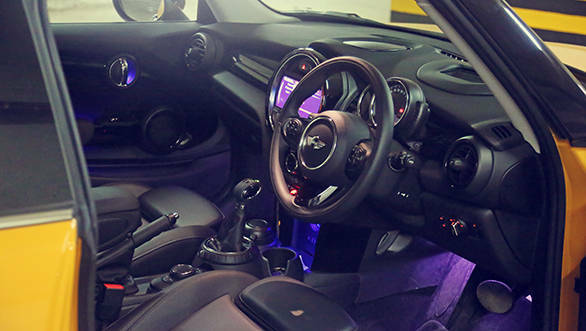 Funny, I had a 2015 F56 miniyours and I felt the ambient lighting was terrible save the stupid center ring. The older gen had it on the b pillars and it was much brighter. The ring of death. The only thing worse was disco mode where it kept changing. Idk how i didn't crash from epilepsy. Also have to disagree. The lighting in my Mustang is just single bulbs and it is still pretty bright. I turn them off. I like it dark. Maybe i need to get checked for glaucoma. Seems like my eyes are blocking out the light! Fine you guys all win this one. Second from what I have seen apart it is almost always a light at one end going through a plastic tube, even cigarette lighter circular lights were doing it like this decades ago and they just kept that low tech design but went with LEDs and better plastic forming technology. That method while simple is a little more application specific and probably a littler harder to source/ and more expensive. I'm not sure how much room you have to hide it but those cheap strips of leds you can cut to any length if used with a dimmer could work very well. Some are stupid bright, a friend used them to light his garage attic! And some might be spaced too far out to get a good glow. But since they are cheap on amazon and run off DC anyway you can quickly test and if you don't like it probably at least re purpose it vs the glowing plastic tube kind. I like the look of it when parked. I think it'd be cool to have different settings depending on different gears/modes. I wouldn't be able to drive with it very bright, so would dim it when driving, but brighten it when parked. How distracting are those lights while driving? I have no idea why these are even legal, but understand they are. 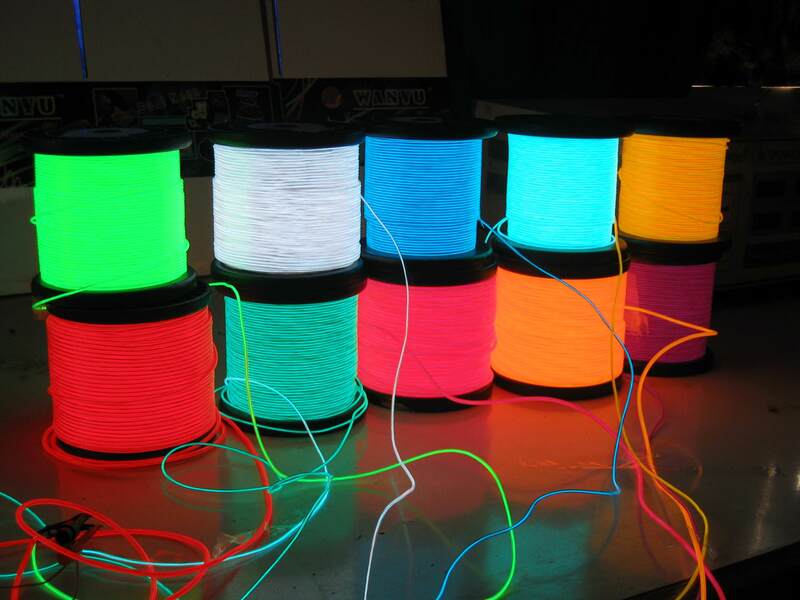 I found something called el wire that might work but it is a single color. What if I want to change it depending on my mood? Not distracting at all. No one has any idea why you think they should be illegal. Nah, my coworkers brand new E Class is bright as hell. Not even a little bit and they help you see stuff in the car at night without turning on the map lights. Pictures are not photoshops however all cameras do make things look very vibrant and colorful in twilight lighting. Check any night or "rich blue sky" photography. Such blue sky doesn't exist, yet it's featured in all cityscape photography extensively and photographers wait for those magic 1/2 hour at certain time of the day to capture it. It's just a sunset, but in pictures it's vibrant blue. Car ambient light is there and I had E-class briefly with that lighting and no it didn't look half as good as in those pics, but it looked good nonetheless. No it wasn't that crazy bright either, it was just there. I personally prefer "pooled" lights where they illuminate spaces or walls rather that just being strips doing nothing but creating lighted strips of nothing. For this reason I love Ford Fusion use of LED and don't care one bit about any of MB. As far as strings go I believe they're just regular LED strips with high diod density... when they tucked away behind something they created pooling light effect that makes light look continuous. Last edited by chocofrappe55; 08-10-2018 at 02:09 AM. 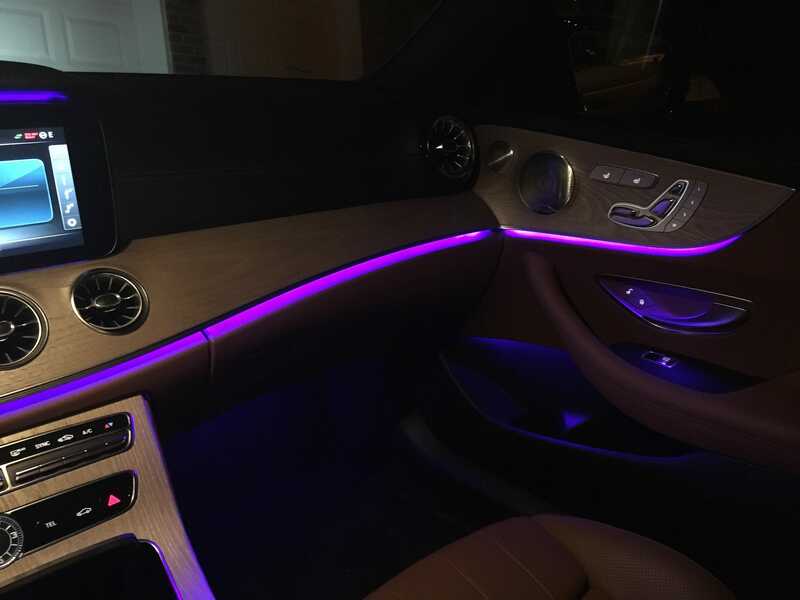 I turned my car's ambient lighting off, I just don't like the interior illuminated at night. My 2012 GTI had just two overhead LEDs which lit the center console that I liked better. This and typically you can set them to a color which doesn't harm your night sight anyway - think of the type of ambient light found in jet fighter cockpits/navy ships. Most of them have options to dim darker during night time so they wouldn't oversaturate your vision.